While its exact origins remain nebulous and hotly debated, it is widely thought that wine was born before the dawn of civilization, as the result of a happy accident—one of the happiest, many will agree, in all of human history. Taken by the sweetness of the wild grape, early nomadic humans picked far more fruit than they could eat in a single sitting. It is theorized that they stored their harvests in crude containers to carry with them in their wanderings, where the grapes naturally fermented, producing something our ancient ancestors found far more bewitching and valuable than the grapes themselves. So enamored were they with this strangely delicious, heart-gladdening liquid byproduct that as soon as they settled down into villages and cities, into a more sedentary pattern of life, vine cultivation and regular wine production began. 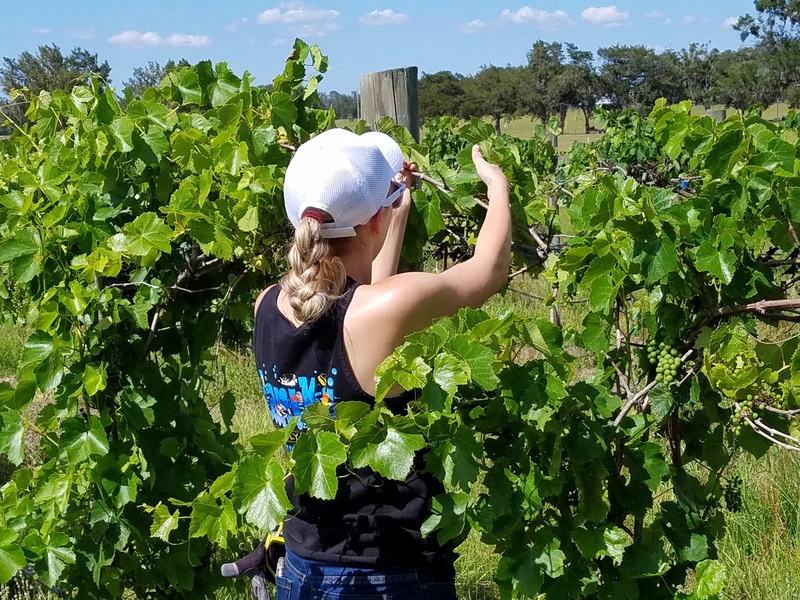 Thousands of years later, a similar caprice led to one North Central Florida family discovering the science and romance of winemaking for themselves. 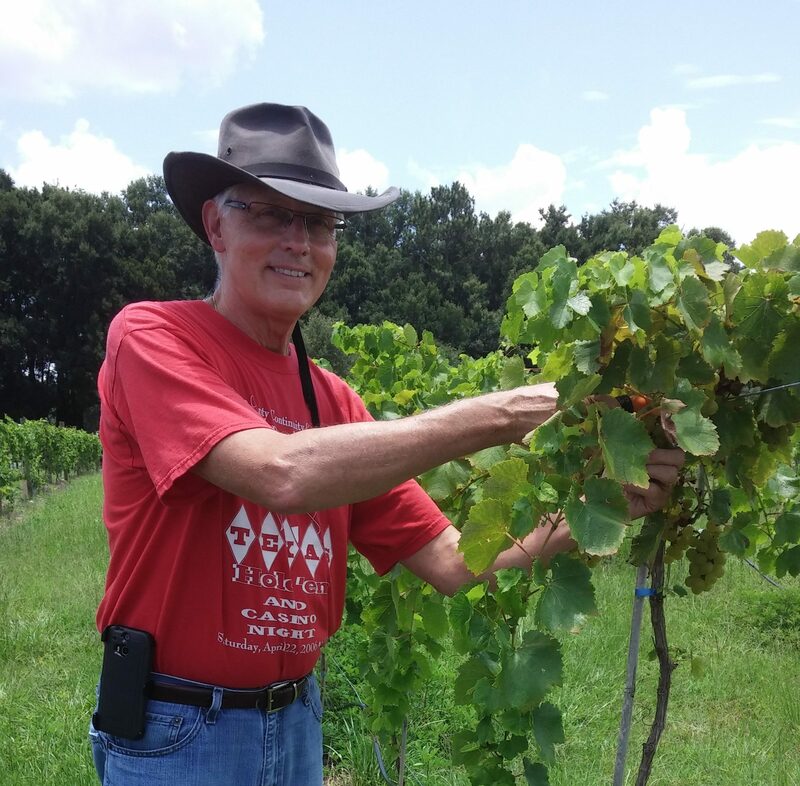 David Sokol tends to his vineyard. The Sokols had always dreamed of viticulture. Wine-lovers both, David—a self-described “English comedy-loving, rifle-shooting husband, father, and grandfather”—and his wife Patricia, a classic Southern lady whose tiny five-foot-even frame belies a seemingly unstoppable energy and piquant wit, shared a passion for cultivation and quality. And if passion alone could build a winemaking business, Katya Vineyards would have been the undisputed Central Florida empire of vino decades ago. But even a few acres of vines demand a notorious amount of care and attention—and time. Something that the Sokols, like most busy Americans, had in short supply for most of their working days. Fortunately for David and Patricia (and, as it would turn out, wine-lovers in the greater Marion County area), time was something they would find more than enough of in retirement. Too much, in fact. Idleness and leisure, to no one’s surprise, did not suit them. 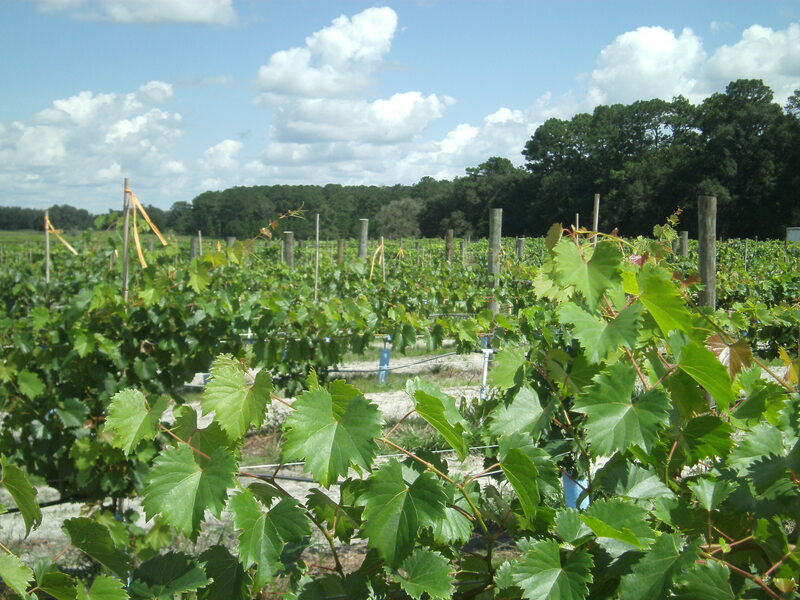 And so it was that, along with their daughter Katherine, the Sokols took the plunge and finally planted their first crop of vines in fall of 2010, and embarked on the adventure Ocala now knows as Katya Vineyards. All that limestone is also what gives the Sokols’ wine, and any wine made here, its own unique, local flavor—its terroir. Grapes absorb flavors from their environment like sponges, making wine as much a product of time and place as much as artful blending and flavoring on the part of the vintner. Wine made in Marion County is no exception. If a single note defines Ocala-made wine, it is a unique crispness not found anywhere else, infused by the very limestone beneath our feet. The Sokols add their own artful touches to complement these natural flavors, but when you taste their wine, you’re getting an unrepeatable taste of the land itself. Beautiful baby Blanc du Bois grapes. Katherine Sokol hard at work. A look at Sokol Vineyard’s lush landscape in August. It’s a typical North Central Florida winter night—spitting rain, cool, and a little misty—and I’m the first of the Showcase marketing team to arrive at Katya Vineyards’ downtown tasting room and wine bar on the first floor of the old Castro building. The Sokols have been kind enough to give us a special tasting presentation tonight, showcasing their house wines and the history behind each. We’ve been eagerly looking forward to it all week. Stepping in from the dark and the rain, I feel a warmth that has nothing to do with temperature settle over me: the open, murmurous room I find myself in is all dark woods, exposed brick, and dim, golden light. It’s clear the Sokols have left much of the raw history of the building untouched—and added a few flourishes all their own in artfully-placed wine barrels, and a magnificent bar stocked floor to ceiling with bottles. David greets me warmly from behind the bar, and helps me find our table, on which he fans out three separate and impressive menus: wine, charcuterie, and chocolate. The rest of our party soon arrives, and Patricia, elegantly festive in a silk Christmas-patterned scarf, heads over to our table armed with the first of four wines. Before she begins pouring, she turns our attention to the table’s centerpiece. At first glance it’s simply a very heavy, weathered-looking bottle in a lantern-like glass case. But this particular bottle is one of many fascinating pieces of history we will discover throughout the evening: it was found in the wreck of the Concorde-class French frigate L’Herminie, a ship that once boasted such passengers as Revolutionary War hero General Lafayette as well as the entire American Congress of 1781. L’Herminie sank in 1793, and the fine Madeira the bottle once held was sadly never enjoyed, but a small piece of the ship sits right here in front of us, over two centuries later. Katya’s flair for the well-aged and beautiful doesn’t end there. One of us compliments the gorgeous, seemingly endless bar, and Patricia informs us that it’s a mix of handcrafted pre-Civil war embellishments, and pine heartwood from the original Coca Cola building in Atlanta. Her husband and daughter are busy behind it serving up glasses of wine and steaming cups of thick chocolate as we marvel at the not-so-hidden surprises this little tasting room keeps unveiling. Patricia Sokol and Showcase’s own Jody Micilcavage posing for a photo behind Katya Winery’s bar. Patricia Sokol presents ‘Katya,’ their eponymous flagship wine, inspired by her daughter Katherine. At last, the wine starts flowing at our table. Patricia pours us the first sample: the vineyard’s eponymous flagship wine, a white inspired by the Sokols’ daughter Katherine. As we take the first taste, Patricia describes it to us with as much energy and excitement as if she were telling us about a living, breathing person: how the Blanc du Bois grapes used in the whites are so versatile, and especially adapted to Central Florida’s unique climate. 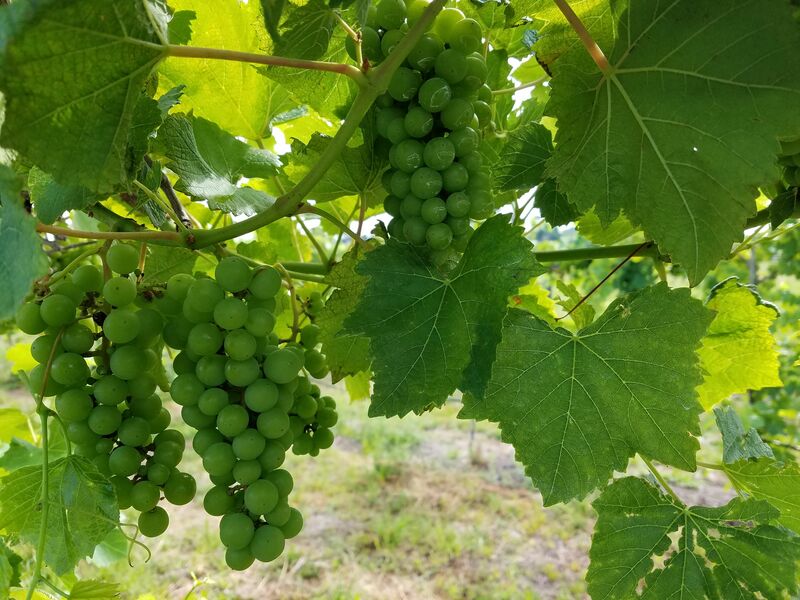 How the hybrids found in Katya’s wines today are as Florida-bred as it gets, developed right here at the University of Florida. Even the labels are local, designed by Ocala artists to incorporate Katya’s unique branding DNA: history, family, and a passion for beautiful things. Patricia knows just the right moment to pause and let the first sip of wine sink in. And sink in it does. Even those of us at the table well-versed in whites are taken aback for a moment. As for myself, more experienced with reds, I’ve never tasted anything like it. Delicately peachy, floral, clean, and a little playful, its personality is so distinct that it’s almost…human. A theme of distinctiveness continues to develop as the second wine comes out: Alexandra, the other white in Katya’s house collection. Though also inspired by daughter Katherine (Alexandra is her middle name), it too has a personality that is completely its own: mineral, peppery, and mature, recalling hot sun and windy hills. After the whites, the reds appear. Patricia continues to artfully weave the story of each wine, her family’s love of craftsmanship apparent in every anecdote she relates in her expert, yet practical and down-to-earth manner. The first red we meet is Mikhail, named for the dancer Mikhail Baryshnikov, and a nod to Katherine’s ballet career. It’s a dark, bewitching ruby with the romantic taste of rich berries and vanilla. While we sip and savor, we learn from Patricia that the ancestor of the Lenoir grape from which Katya’s red wines are made was brought to Florida by French Huguenots in the 1500s and naturally cross-bred with native species. They’re also a non-muscadine variety, somewhat unique for a Florida vineyard. Last but certainly not least in line is Nikolai, so-called in honor of the only Sokol grandson, four year old Nikolai Douglas. And it’s the perfect namesake: energetic, headstrong, and dynamic, with hints of earth and chocolate. It’s also a strong and fitting endnote to an evening full of truly unique, expertly-crafted wines unlike anything we’ve ever experienced. 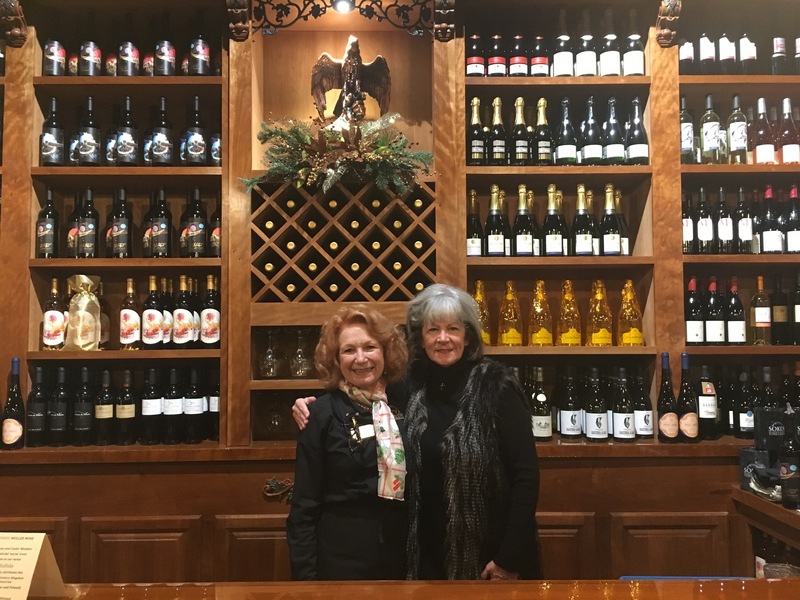 Every wine-lover in North Central Florida will find something to enchant and delight at Katya Vineyards—not least of which is the Sokols themselves, who don’t simply desire to tell their patrons facts about wine, but to communicate the artistry inherent in each wine they offer. At Katya, wine is deeply personal—David, Patricia, and Katherine work the land, dream up the blends, and craft the batches themselves. 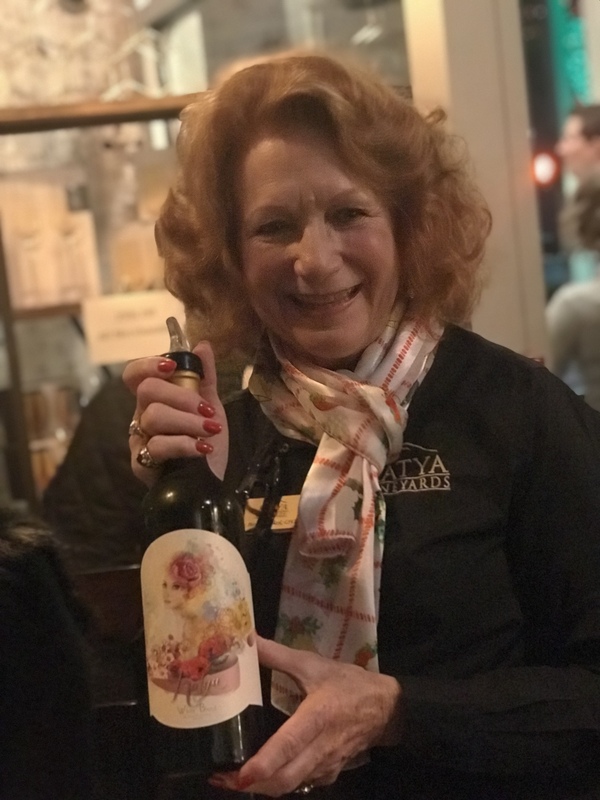 That deep, personal touch is what gives each Katya wine its unrepeatable personality, and what’s sure to make Katya Vineyards an Ocala institution. If it’s possible to bottle everything you love about horse country—the history, the natural beauty, the closeness, the richness—David, Patricia, and Katherine have done it, and we hope they keep doing it for years to come. For more information on the Sokol’s and Katya Winery, visit their website or like them on Facebook for continued updates. Community Spotlight is brought to you by Showcase Properties of Central Florida, a boutique real estate firm specializing in luxury equestrian farms, residential, and vacant land in the Ocala / Marion County area. Contact us today to find out how we can help you Buy & Sell with Confidence.